We take orders over the phone in our office or customers can mail in check payments. How do I handle these types of orders? /Creating, Editing and Managing Events /We take orders over the phone in our office or customers can mail in check payments. How do I handle these types of orders? You can handle these types of sales through your account. While logged in, all you need to do is go through the sales process on your event page. 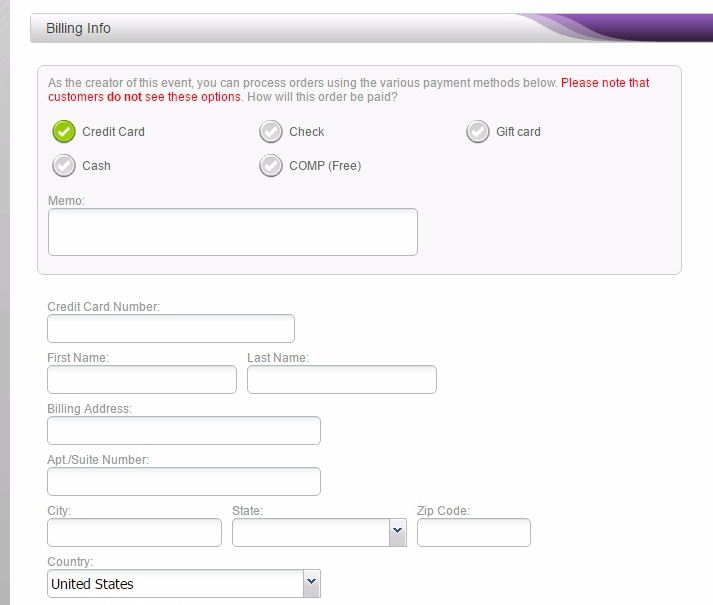 During checkout you will have additional options available to you ONLY while logged in. Your customers will not see these options as they are only promoter tools for checking out. There will be payment options such as Check, Gift Card, Cash, and COMP. NOTE: Service fees still apply when making any type of promoter sale except for COMP. Make sure you collect these fees as you will be billed a service fee on these sales.